Sunset in the Golan Heights, near the Israeli-Syrian border. This was a site of the Six Day War in 1967. – Photograph by Michael Anderson. Last week, I wrote about going through a spiritual wilderness. The wilderness experience was described there, and I encourage you to go back and take a read. But now it’s time to understand the purpose of the wilderness. When we gain an understanding of the experience, we can more fully appreciate its value and usefulness is building our maturity, humility, self-discovery, purification and refining, strength, revelation, and the fulfillment of God’s promises to us. Whew! That’s a lot to take it, so let me briefly break it down. The wilderness causes us to mature as believers. “So then, since Christ suffered physical pain, you must arm yourselves with the same attitude He had, and be ready to suffer too. For if you have suffered physically for Christ, you have finished with sin.”–1 Peter 4:1 NLT. Think back to when Jesus, having just been baptized in the Jordan River, was led to the wilderness. For 40 days he went without food and water, suffering anguish there, and was repeatedly tempted by Satan himself. Further, “Even though Jesus was God’s Son, He learned obedience from the things He suffered.”–Hebrews 5:8 NLT. You see, the suffering that the very Son of God endured built obedience. How much spiritual growth can we experience when we simply obey God in the wilderness (suffering). The wilderness builds humility in our lives. Scripture tells us that God gives grace to the humble, and that grace is POWER to do what we cannot do in our own ability. Deuteronomy 8 states, “remember how the Lord your God led you through the wilderness these forty years, humbling you and testing you to prove your character, and to find out whether or not you would obey His commands.” You see, as John Bevere says, ” Humility is a grace magnet.” When we are humbled, we place ourselves at the feet of our Savior, who rewards us with His grace. Isaiah 57:15 puts it this way, “For this is what the high and exalted One says–He who lives forever, whose name is holy: ‘I live in a high and holy place, but also with the one who is contrite and lowly in spirit, to revive the heart of the contrite. '” God rewards our humility with a revived heart. The wilderness is a season of self-discovery. That phrase evokes thoughts of self-awareness, and other new age ideas. However, we learn what is really in our hearts through the adversities of the wilderness. Remember that passage in Deuteronomy 8? The reason for the wilderness was for God to show what was really in the Israelites’ hearts. Sin hardens the heart, but God exposes that and reveals the hardness or stubbornness of our heart that He might revive our hearts through His grace. The wilderness brings purification and refining. Once our heart is seen for what it really is. God uses the time to refine our hearts just as gold is refined—through the fire. The impurities rise to the top and they can be taken away. What remains is pure gold–and for us, a pure heart. Jesus said, “Blessed are the pure in heart, for they shall see God.” (Matthew 5:8). What a treasure is the pure heart…the ability to see God. When are hearts are pure we understand (see) how God is working around us and in us, and we see the purpose He has for our lives. We enjoy the sweet satisfaction of an intimate relationship with Him. The wilderness builds strength in our life. John the Baptist, the one who would announce the coming of Messiah and who would preach the message of repentance was a man of the wilderness. Luke states of John, “and the child grew and became strong in spirit; and he lived in the wilderness until he appeared publicly to Israel.” Luke 1:80. I can’t help but think of all the time Moses spent in the wilderness gaining strength…inner strength that would ultimately prepare him for the purpose God had for his life. Were he to assumed the purpose early in his life, Moses would have never been ready or successful, for his character and strength were inadequate for the God-sized role of his life. The wilderness brings revelation. There’s a phrase that scares the casual observer. But for the one who walks in relationship with Jesus, the revelation that God gives us is glorious, beautiful, and powerful. Once the impurities of our life are melted away, our heart — our eyes are able to see God and to hear Him speak. Isaiah 40:3-5 tell us, “A voice of one calling in the wilderness prepare the way for the Lord; make straight in the desert a highway for our God. Every valley shall be raised up, every mountain and hill made low; the rough ground shall become level, the rugged places a plain. And the glory of the Lord will be revealed, and all people will see it together. For the mouth of the Lord has spoken.” God speaks through His Word and through His servants. When our hearts are fully prepared, cleansed, humble, and mature, God’s voice is heard and His glory is revealed. I have personally experienced many times where God has spoken His desire, His plan, His instruction, His comfort, His peace into my life. There is no denying and no mistaking the voice of God. There is nothing more beautiful either. You see, when you realize all that God is doing in our wilderness experiences, you begin to understand that He is preparing us for the realization of the promises He has made to us. Sometimes we think that God shows us something and it should take place immediately. But God, in His great wisdom and care for us, prepares us for the promises so that we will be successful and fulfilled. So declare with me these truths from God’s Word. Hope. Everybody talks about it. Everybody wants to have it. So, what is hope? To the Christian, hope is so much more than wishful thinking. In fact, the little greek word for hope in the New Testament actually refers to a confident expectation. In the Old Testament, hope was in God for His Messiah to come. 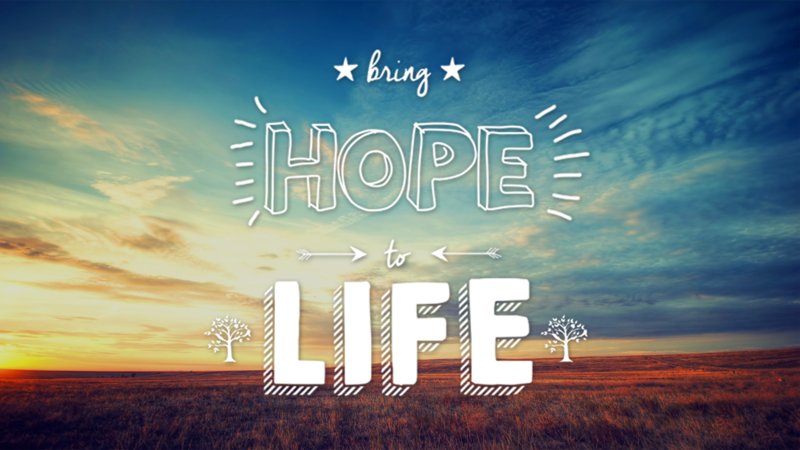 In the New Testament, hope is in Jesus Christ, the Messiah, for the things to come. I want to share with you 10 Results of Hope for a Believer in Christ. Of course, there are many more than ten, but let’s start with them. Because of limitations of space, I’ll share Bible references with each. You go and look them up and find hope in Jesus too. How about it? Are you looking for real hope? You will only find it in Jesus. I pray that you will follow Him and rely on Him! Here’s Hope!